Firstly, what a place! I don’t really know where to start. 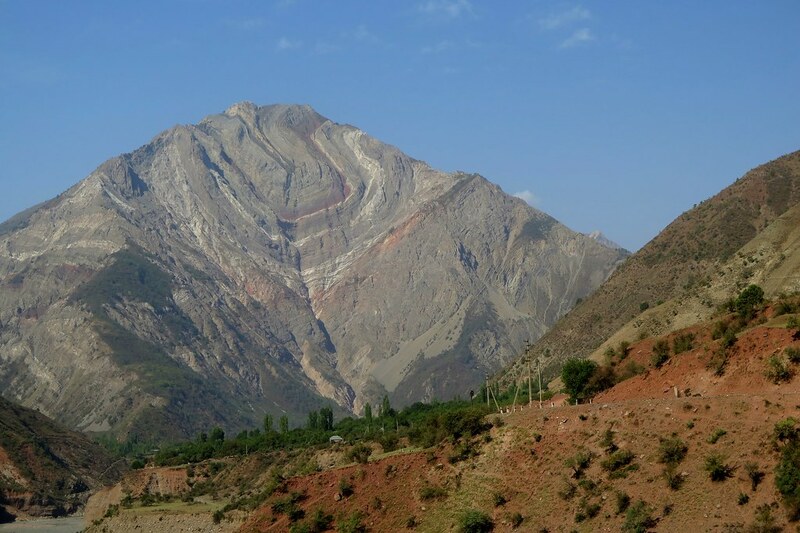 Tajikistan is the poorest of the ‘stans and it was visibly obvious. It doesn’t help that the country is so mountainous, making it hard to access and also hard to grow crops and keep animals. 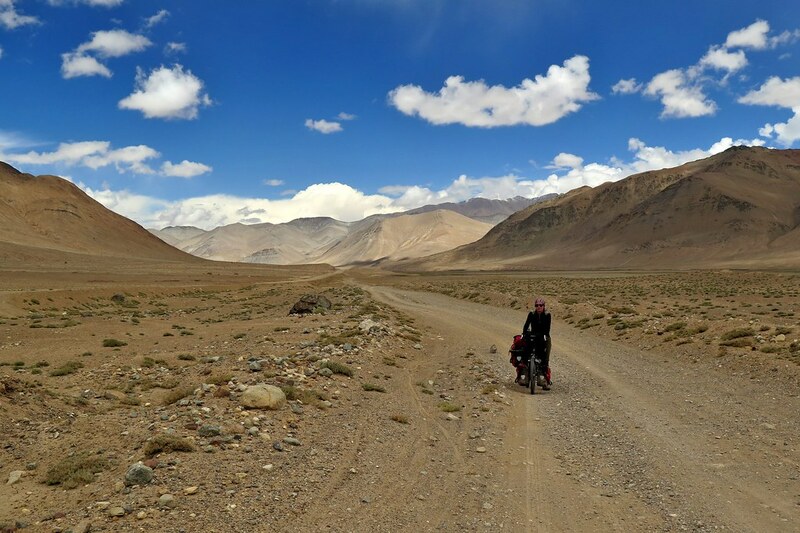 We were in the Pamirs during the short season when it’s warm enough to be comfortable and enjoyable to cycle through, we can’t imagine what it’s like in the harsh winter (ok maybe Andy can with his love of skiing and scoping out where would be amazing to ski). With the high peaks brought incredible scenery, like nowhere we have seen before. Fifty percent of the country is over 3,000m. It was breathtaking and constantly changing. It was tough going and some of the most challenging cycling we have ever done, and somewhere we will always look back upon and be proud we managed to cycle it. When we first arrived over the border we had been travelling through 25km of no man’s land, so we couldn’t really get much of an impression in this new country when it hadn’t changed too much. 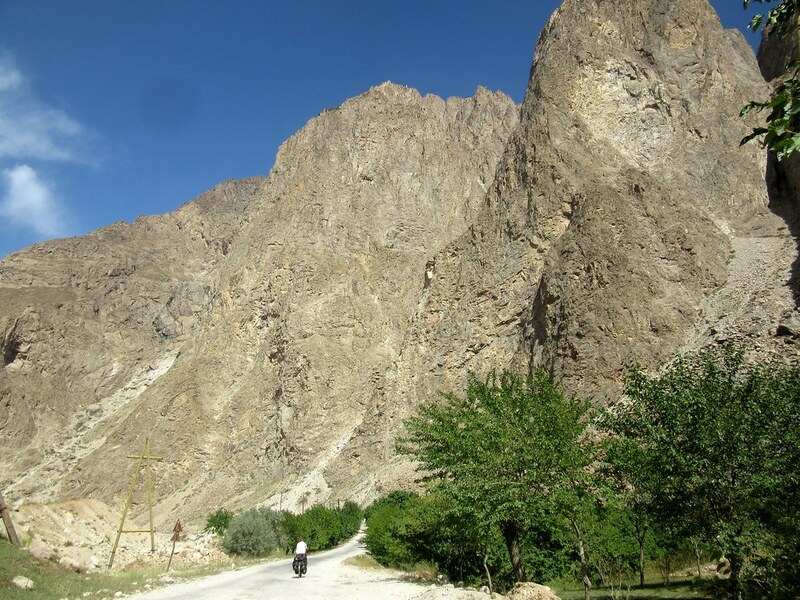 We didn’t meet many Tajik people at first travelling from this end of the country. Our first impression was just the stunning landscape and how easy it was to camp with no one around. We really enjoyed camping in this part of the world, waking up to such beauty every day. There were a number of vehicles passing through each day but otherwise very few people living there. But a few did! Incredibly they could survive living there. 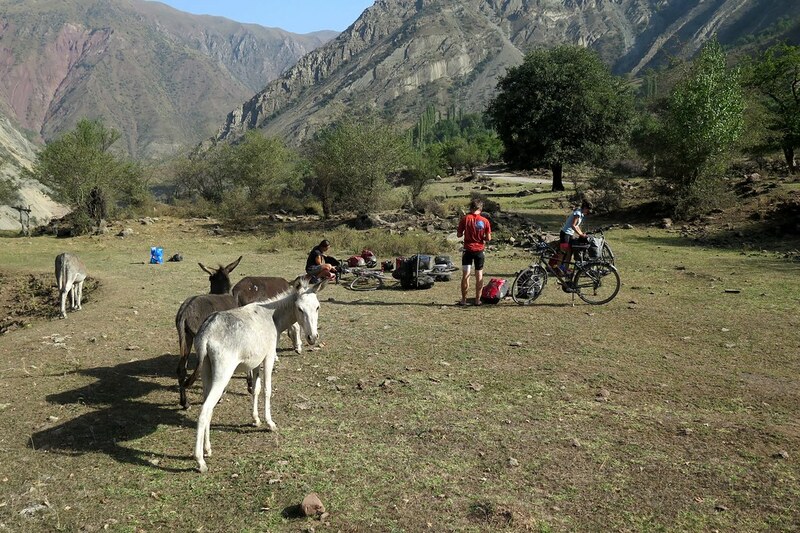 We did meet a large number of touring cyclists coming the other way though. It’s a popular route and with this short ideal time for weather it meant there were a lot. It really is great meeting fellow cyclists with a similar idea of travel but you of course can’t click with everyone and having the same conversation sometimes can become a little tiresome. Plus hearing over and over again we would probably get sick and it was tough wasn’t what we wanted to hear. Anyway it’s still, mostly, great to meet other cyclists on the road. For the first stretch most of the time we couldn’t get over the vastness of it all. It actually felt so surreal that it’s very hard to put into words. It was the section of the trip Andy had been most excited about and I had felt most anxious about. Considering we were up over 4,000m for some time it was sometimes hard to comprehend but with our laboured breathing and trouble sleeping we definitely knew we were up high. There were some tough climbs but during the first part on mostly pretty good roads we were able to distract ourselves with beautiful views and drifting off into our own worlds, or cycling side by side and chatting. 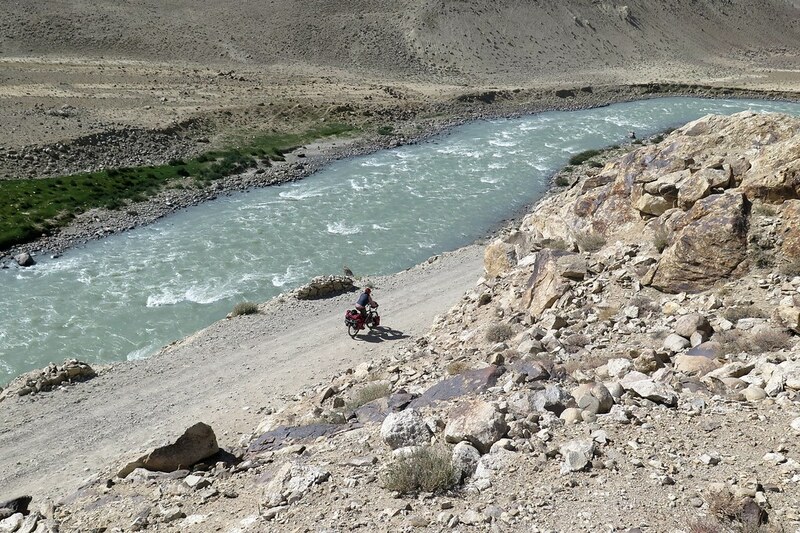 We had decided to take the Wakhan valley which runs parallel to Afghanistan with the Panj river. I’m sure when people hear we were so close (at some points literally only 15 metres away) to Afghanistan they think it may be dangerous but it’s a remote part with few people living across the water and offered us no threat. The biggest problem the government are faced with is trying to control the drug trafficking of heroin and raw opium mostly bound for Russia. As we cycled along we saw a strong military presence, soldiers walking along the road or high up above us monitoring any movements across the river. There is such a large area to cover I’m sure it is impossible to stop and maybe many don’t want it to as it offers a large illegal source of income to the country which is much needed. Another source of income is from immigrant remittances which the country is highly dependent on. With this fragile economy there is a lot of corruption. We saw a small element of this when we drove to the Fan Mountains. Just outside of Dushanbe our driver was pulled over 3 times to ‘check his papers’ but he just walked over to the police officer and handed over a couple of somani (20p) each time. In Dushanbe we had taxi drivers avoid certain roads to avoid paying these ‘fees’. The people we met on our way were extremely friendly. 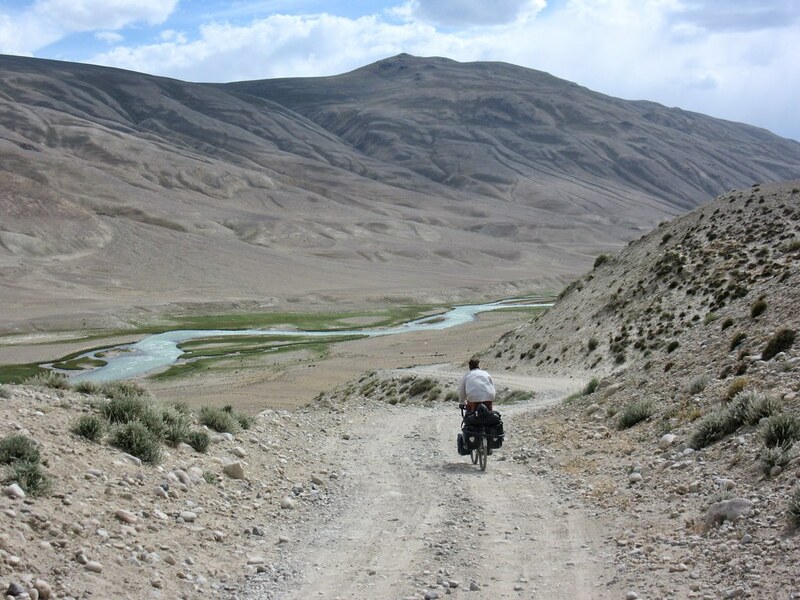 During our time on the Pamir Highway we had offers of chai and once down in the Wakhan valley where there were a lot more people we were constantly offered fruit. Lots of hellos and waves. With little to do in this area the kids became overly excited by us cycling past and would shout continuously or run to where we were for a high five. Sometimes it was hard for us to keep up the enthusiasm to shout back but we did our best. The villages were mostly quite poor with water running through or pipes pumping out water. 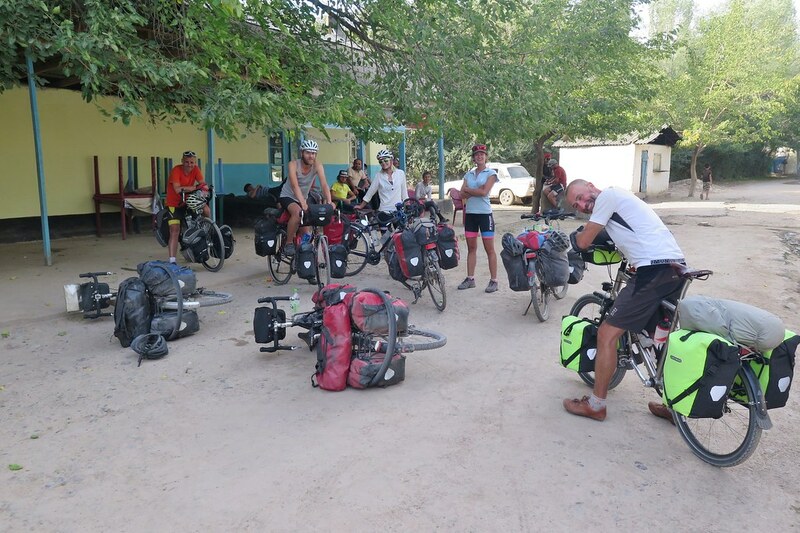 We knew that a large number of cyclists/tourists got sick in this part of Central Asia and so we were doing all we could to avoid it. This did mean that we tried to cook for ourselves most of the time and try and buy water when we could. There was not too much food on offer as we cycle through. Many people are at risk of not getting enough food and with the area being so remote they have had to sometimes turn to external aid for help. Even with all this people seemed happy and content, it’s amazing to see how resilient people are. The roads as you may have gathered from previous blog posts were definitely the hardest we’ve cycled to date over a longer period of time. 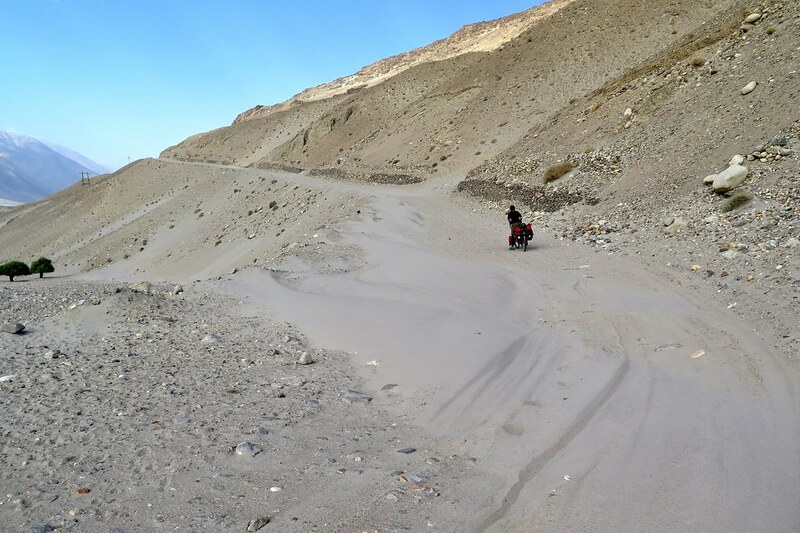 We had such a mix of surfaces but for me the hardest was sand, I found it pretty impossible to get through the deeper stuff. Andy coped pretty well on it but it did zap you of energy. It did sometimes distract from the views as you needed to concentrate on what you were going over, then again that makes a good excuse for a break to look around properly. And wow did we see some views, some of the best we’ve ever seen. I still can’t believe some of the heights we reached and what was around us. Just incredible. The infrastructure is not very developed making it harder especially for locals but I guess that’s what added to the charm for us. I think we were super lucky with the weather, especially up high, we had a little bit of rain just on one day but not much. 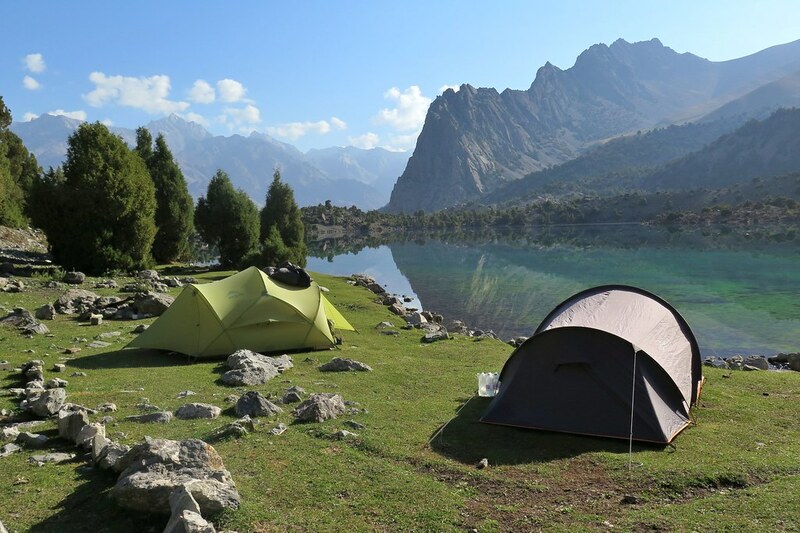 We experienced no frost or snow, even though we camped over 4,000m 3-4 times. There were clouds but also crazy blues skies. We tried to be careful with applying sun tan lotion and protecting our lips after reading about others suffering from sun burn and chapped lips, at those heights you are exposed to all the elements. 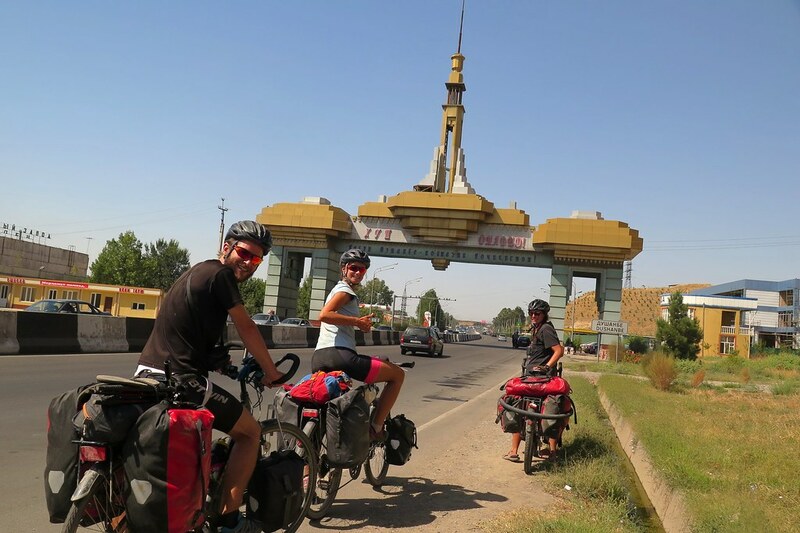 Once we were close to Dushanbe we were so excited to think about the food we’d eat, the drinks to celebrate and being able to shower every day! But it wasn’t quite the arrival we had expected. The night before Andy and I were super sick and it took every last bit of energy to pack up the tent and get the bags on the bike to cycle the 37km to our hostel. We arrived and collapsed on our bed and stayed put for several hours. The next day after we’d taken antibiotics, we’d bought just in case we did get sick, seemed to be doing the trick and we felt much better. 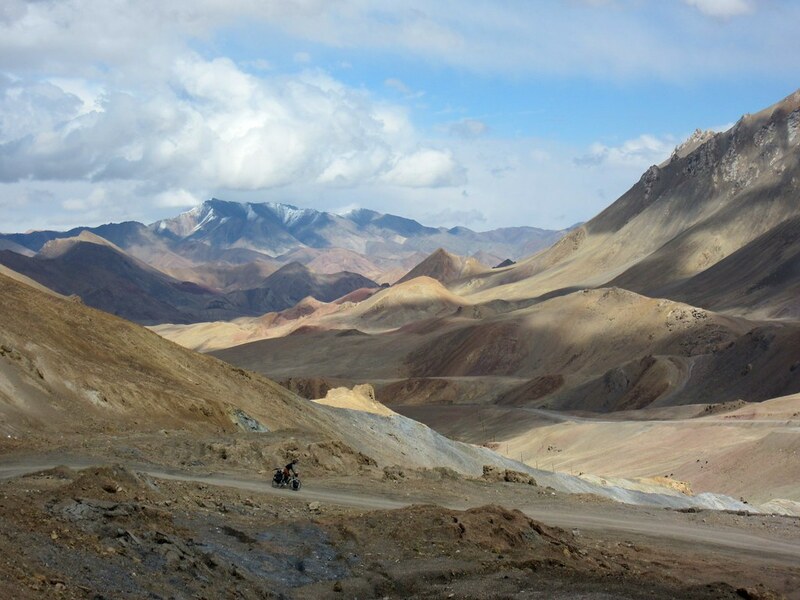 Even our trip to the Fan Mountains was all fine until the day we returned I started to feel bad again and finally went to the hospital to see if it was anything more sinister. Yep amoebic dysentery. At least I knew what it was and could get the medication. All our hard work of trying to not get sick didn’t quite work but there you go. Dushanbe was a really cool city and I wish we’d felt better during our time here to have actually explored. We realised as we left we had taken zero photos of the place. We still saw most of the sites but in going from place to place rather than our usual wander through a place to explore. 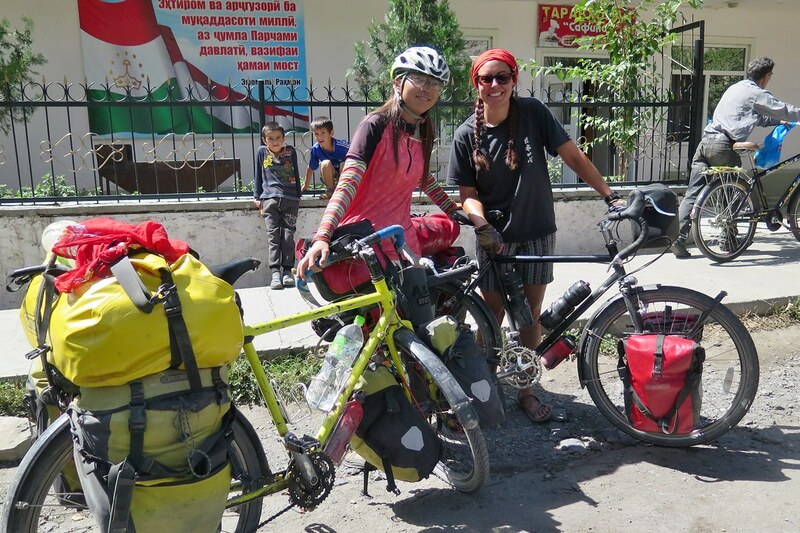 We did have an amazing trip to the Fan Mountains with the lovely Claire and Tim who we’d cycled into Dushanbe with and spent a lot of evenings together along the whole route through Tajikistan. It was cool to cycle with another couple for a few days. The dynamics change and it made a refreshing change to our trip (maybe especially for Andy I can’t whinge as much with other people around). 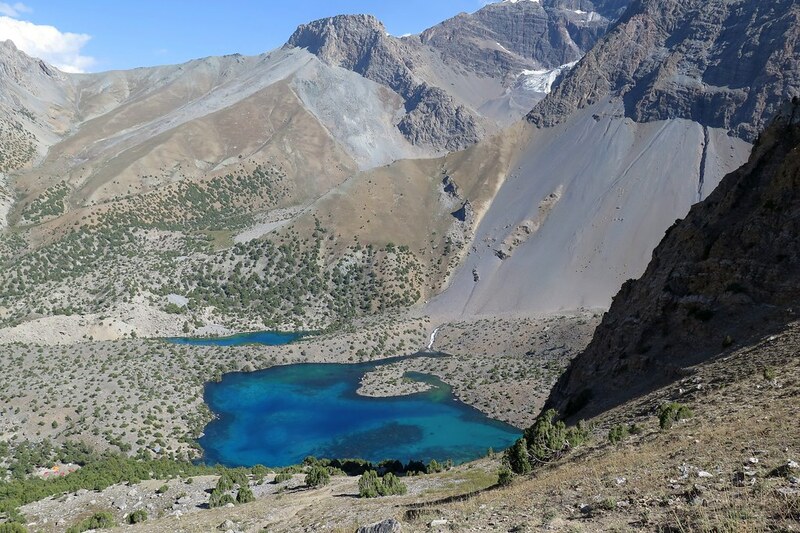 But we especially loved our trip to the Fan Mountains, another magical place in Tajikistan. 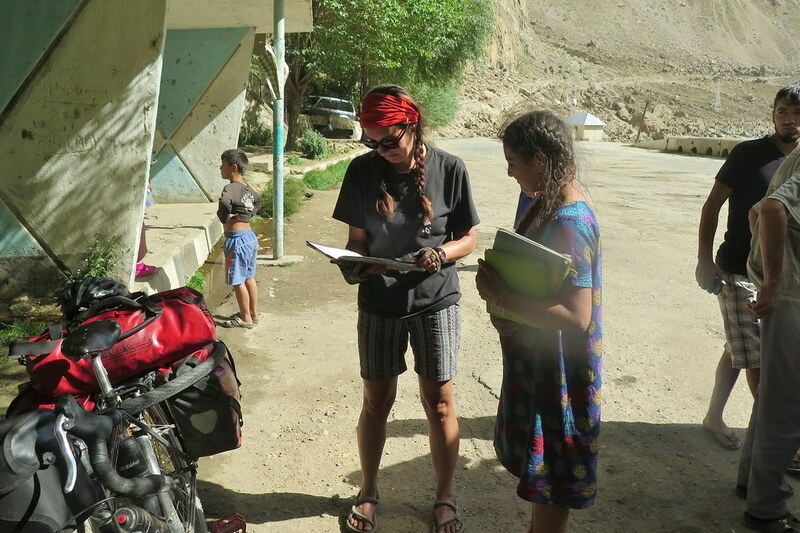 Overall we absolutely loved our time in Tajikistan. 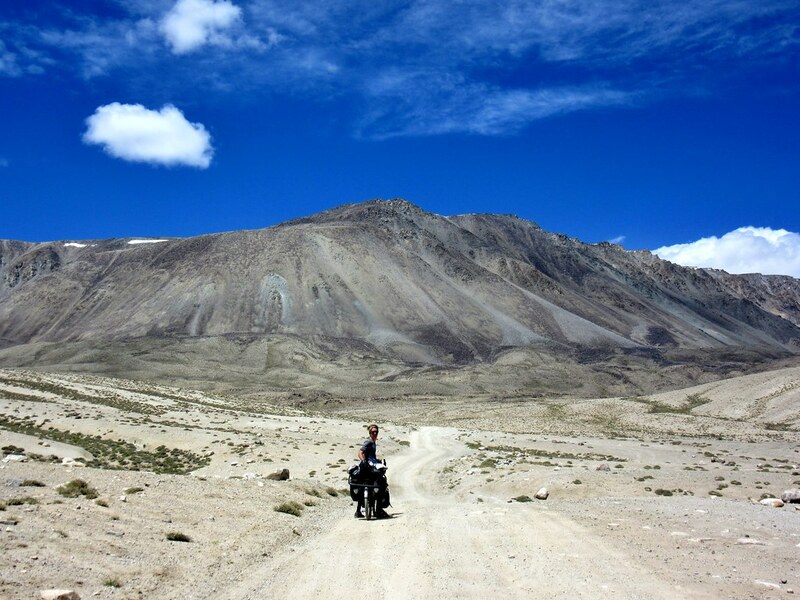 It was one of the hardest things we’ve done but definitely one of the most rewarding with the stunning landscape. Sadly the food wasn’t amazing but I’m sure we’ll make up for that in other countries. The people strong and kind. The kids cheeky. The roads hard. It really was amazing but also I think I felt relief when we left. 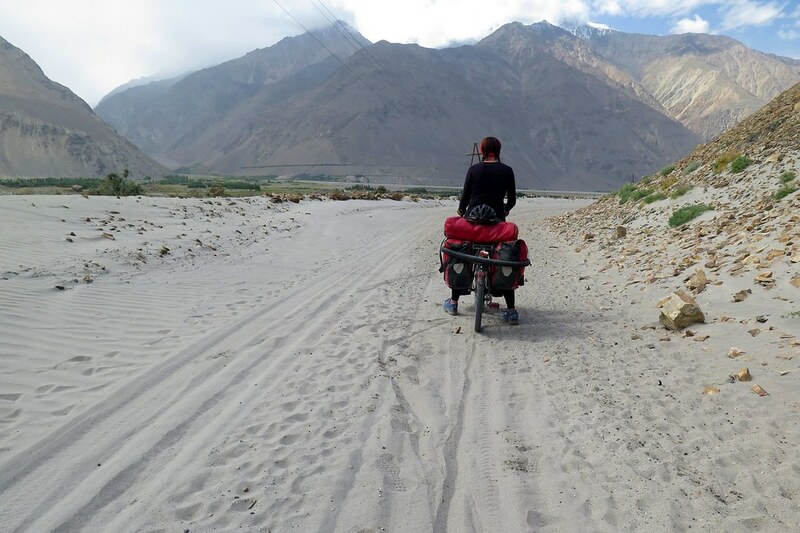 It’s a hard country to be cycling in for a long period of time, with ill health and the need for a few more home comforts it was a good time to get moving onto the next country. The highlight is a hard one because we really did have so many great moments. 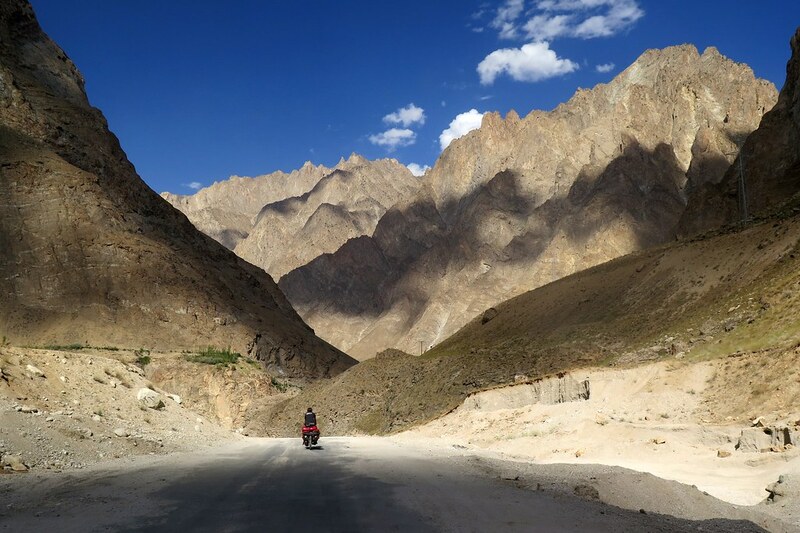 I think the first section of the Pamir Highway was magical and so remote, but also the Fan Mountains trip was also incredible. The lowlight was definitely being sick. Cycling and a weak body is no fun. And sand!!! It’s too hard to cycle through. 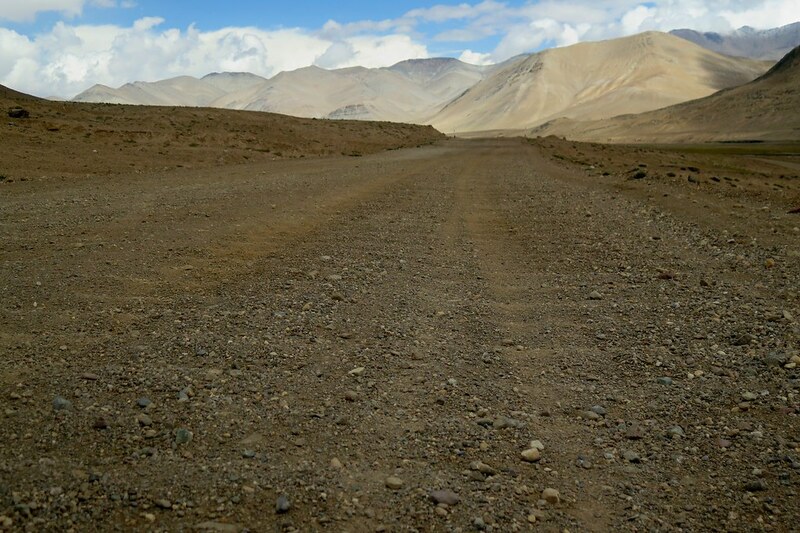 beautiful landcape , reminds me of ladakh. It is so interesting to read your blog and the landscape is just stunning. 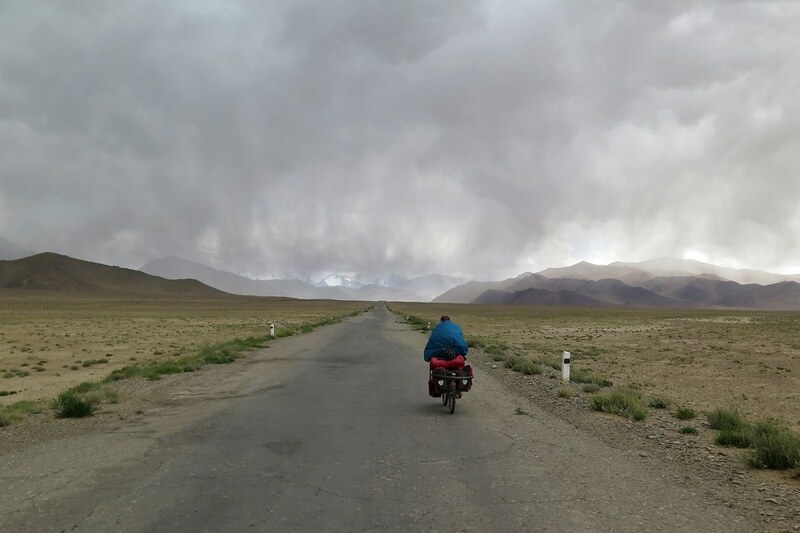 Our planning phase, researching our next destinations is almost as exciting as the trip itself:-) We are really really looking forward to cross the Pamir in May/June. Thanks for reading! I’m sure you’ll have a great trip, it’s an incredible part of the world.